Ford has hosted a high-profile Go Further event in Amsterdam to showcase its vision for the future, much of which looks to focus on an expending range of hybrid vehicles. Taking center stage was an all-new Kuga SUV, which will comes in a range of mild-hybrid (also known as battery-assisted hybrid), plug-in and full-hybrid models. Ford also revealed its plans for an innovative new SUV-flavoured compact car in the shape of the Puma Crossover, which will feature a 48-volt mild-hybrid powertrain. It’ll be built in Romania and is set to go on sale at the end of the year. We got a fleeting glimpse of it through a blizzard of lasers, but that was about it. Meanwhile, the tantalizing new Ford Kuga will come in several different versions, with Kuga Plug-In Hybrid, Kuga EcoBlue Hybrid (mild-hybrid) and Kuga Hybrid (full-hybrid) variants. The models will sit alongside Ford’s 2.0-liter EcoBlue diesel, 1.5-liter EcoBlue diesel and 1.5-liter EcoBoost petrol engines, and intelligent new eight-speed automatic transmission. Topping out the range will be Titanium, ST Line and premium Vignale models. 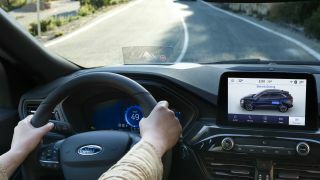 Tech will feature heavily in the new Kuga, including a FordPass Connect embedded modem, wireless charging pad, and Ford’s SYNC 3 infotainment system supported by an eight-inch central touchscreen. Audio fans will be able to enjoy their tunes via a B&O sound system, while a new 12.3-inch ‘true color’ instrument cluster is, claims Ford, more informative, intuitive and easier to read. Driver assistance features are similarly well catered for with new Stop & Go, Speed Sign Recognition and Lane-Centring technologies help drivers negotiate stop-start and highway traffic. Meanwhile, predictive curve light and sign-based lights help drivers see more clearly in the dark. Head-up display technology and Active Park Assist 2 rounds out the tech aspect nicely. The Go Further experience also featured two already hugely popular Ford models, the Fiesta and the Focus, but with a twist in the shape of battery power. The Fiesta and Focus EcoBoost Hybrid models form part of a new line-up of Ford Hybrid and all-electric cars, SUVs and commercial vehicles. Both cars are already best-sellers in their own right, but Ford hopes the new models will fit with our changing tastes. The new 48-volt mild-hybrid Fiesta and Focus EcoBoost Hybrid editions will be available next year and will feature several innovations. Central to these is the belt-driven integrated starter/generator (BISG), which takes the place of a standard alternator. This, says Ford, means energy can effectively be harvested instead of being wasted during braking and coasting. In turn the system will be able to charge the 48-volt lithium-ion air-cooled battery pack. The technology will work hand-in-hand with Ford’s three-cylinder 1.0-litre EcoBoost engine, which will also feature a bigger and better turbocharger for added punch in the performance department. However, despite the new hybrid direction, Ford has always kept a keen eye on the driving experience. So the company has done its best not to disappoint with the two new cars. The ‘sophisticated mild-hybrid’ architecture is said to deliver improved fuel-efficiency while also retaining an edge when you’re behind the wheel. And, as you’d expect, both cars promise to offer a fizzy driving experience thanks to their already well-proven handling characteristics. Earlier this year Ford took the covers off its Mondeo Hybrid wagon, which was also present. Meanwhile, Ford executives unveiled an all-electric Transit along with extensive plans for mild-hybrid versions of the Transit two-tonne and Transit Custom vans, as well as a Tourneo Custom people-mover, all of which are in the works for later in 2019. Oh, and for good measure there’s a brand new European edition of Ford’s best-selling Explorer model, but it’s left-hand drive only, so won’t be coming to the UK.